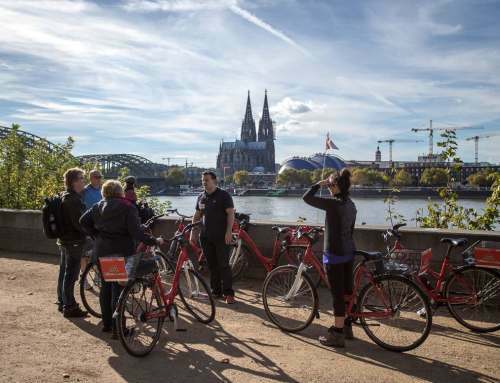 A guided bike tour is one of your highlights of your Cologne trip. 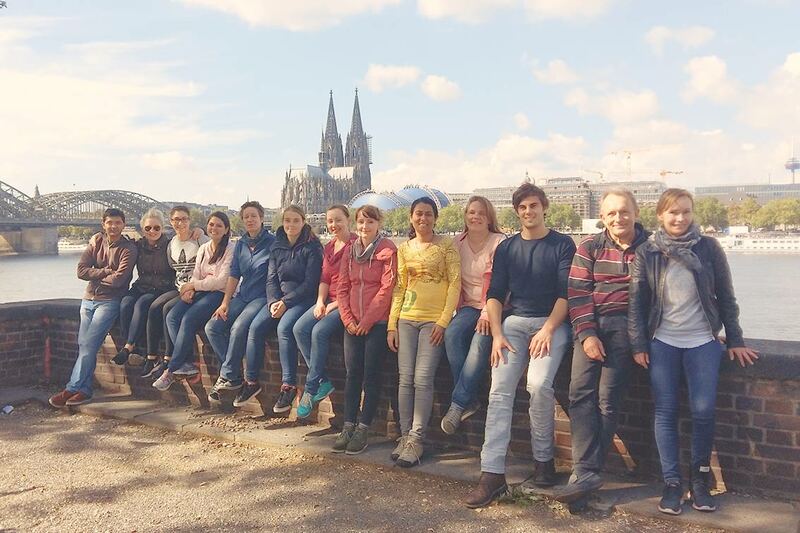 Being active in the group and enjoying the Cologne city culture together is great fun! 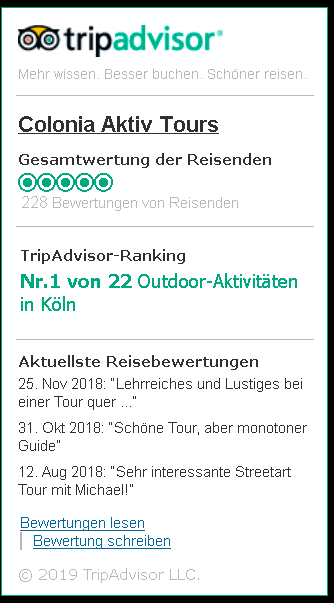 Whether with long-term friends, family or for a club trip: We offer your group a great informative and relaxing bike tour with the right mixture of sightseeing, funny anecdotes and airstream. Our guide accompanies you through Cologne’s green areas, over bridges and through the lively old town. Whether for eight or as an event with more than one hundred guests. We present you Cologne from the saddle! 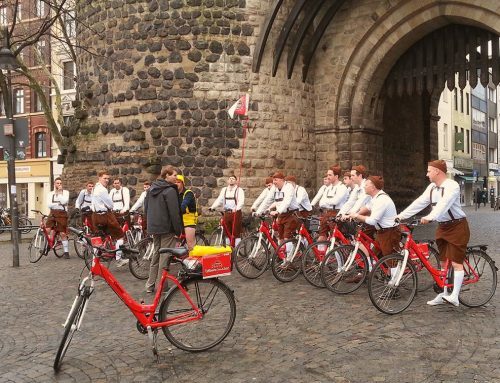 We meet at our bicycle rental near the Eigelsteintor, only a few minutes walk from Cologne main station. Here we provide you with bike helmets, rain ponchos and other accessories. There is a toilet and the possibility to buy drinks for take away. 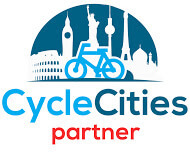 We will fit our rental bikes to you individually. 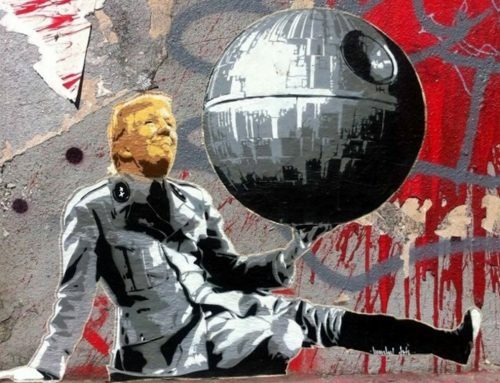 And it beginns! On the tour, our guide will set you up at your pace and interests in Cologne. We are looking for an entertaining, colorful lecture style in which we would rather tell you anecdotes than to bore you with annual figures. Socializing is not too short! Of course, the group can not miss out on socializing! A 30 minute break is provided after half the route. We are looking for you. We would like to stop for a beer garden or a Brauhaus, to an ice cream parlor or typical Kölsch to the nearest kiosk. As a closed group, we make an individual offer to your needs. Since group sizes always fluctuate somewhat, we usually arrange a flat rate depending on the tour length and the maximum number of participants. 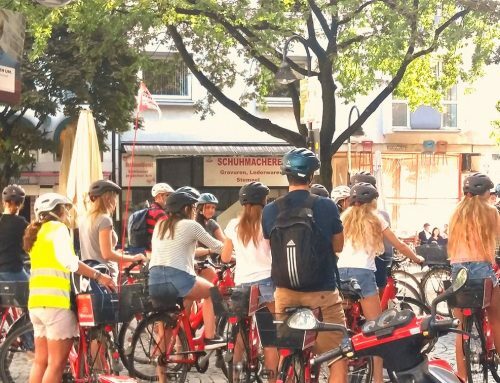 As an orientation, for a three-hour guided tour including rental bicycles, without consumption or bike delivery, we charge 29 € per participant. Frequently asked questions about weather, reservation and security! My team and I are looking forward to presenting you from the saddle to Cologne.